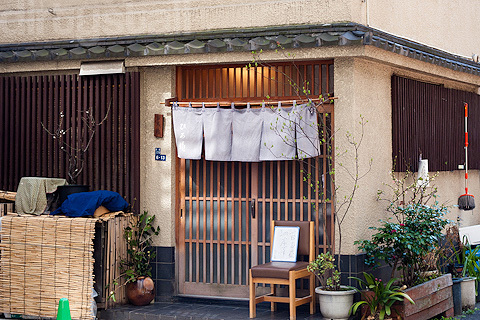 Hirosaku is a homely little restaurant that is family-run, helmed by a fatherly chef and his very kind wife. Sometimes at night their daughter helps them out as well. It’s a very small restaurant, only having 1 table for 4 and a counter with 5 seats on the 1st floor, and several small private rooms on the 2nd floor. Lunch service is only for 1 hour, from noon till 1pm, and since only the 1st floor is open for lunch, there are only 9 seats and reservations are a must! 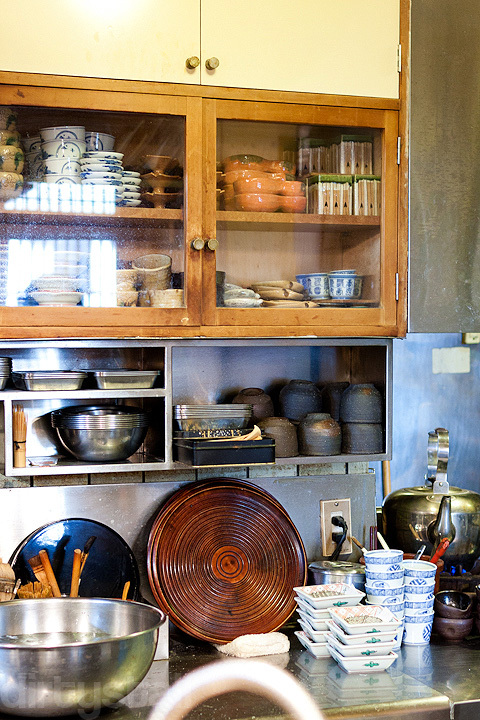 Nothing fancy about this place either; very minimalist and homely. The first dish was just a simple bowl of tofu. But what a bowl of tofu it was! 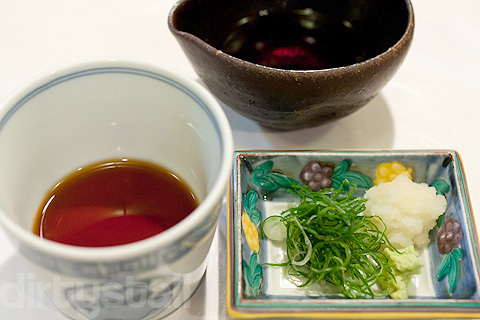 It had a sort of refreshing taste to it, clean and pure – which is why it had to be eaten with the accompaniments below. 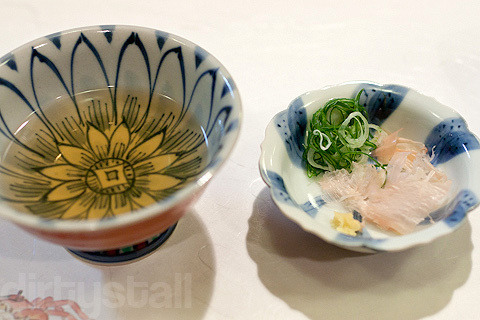 Here they provided dashi flakes with a light shoyu sauce. Next came a sashimi course – this was tai sashimi rolled up with what I think is grated daikon inside with flecks of perilla, and topped with some seaweed. 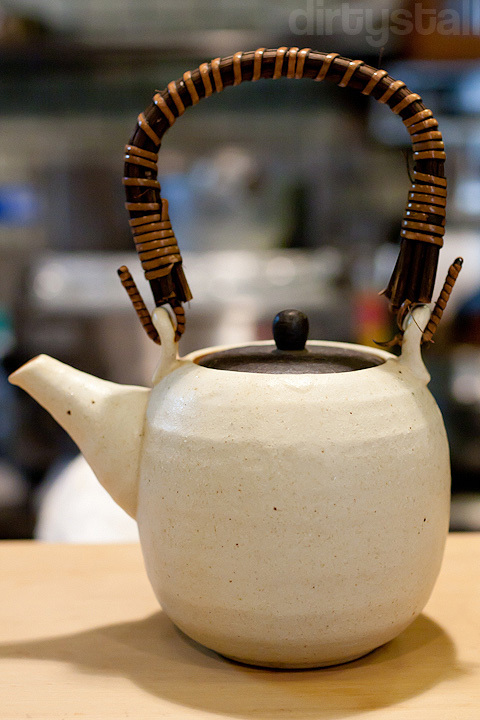 Green tea was self-service in a pot, but it was refilled constantly. 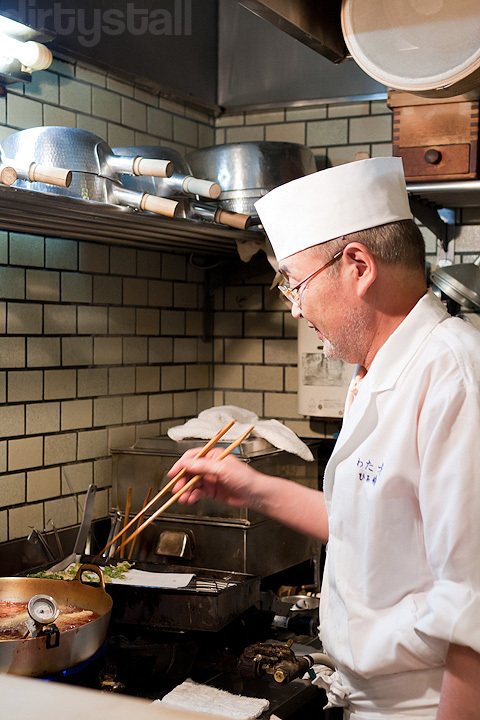 Now the chef was busy preparing the next dish. 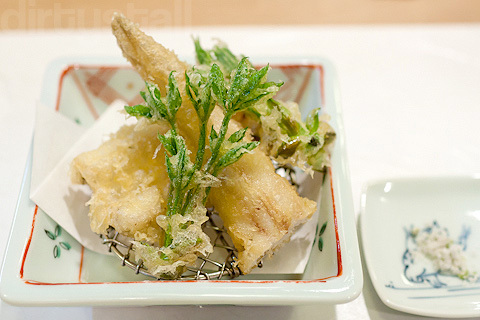 It was anago tempura with some mountain sprouts. 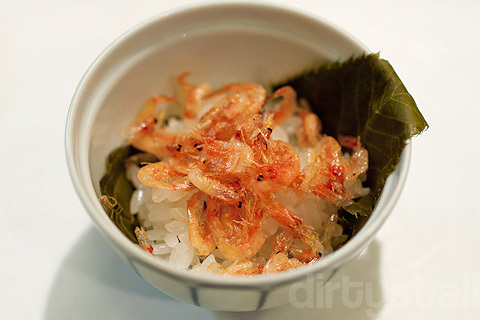 Really tender with just a very thin layer of tempura to crisp it up. Some herb salt was also provided at the side. 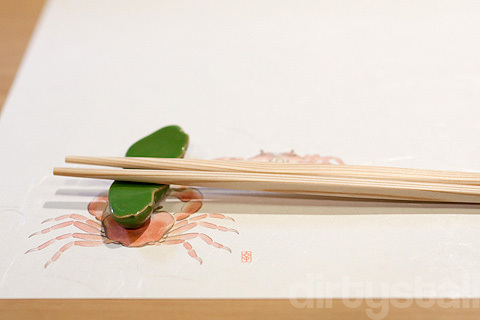 This was followed by a small bowl of rice, topped with very lightly fried sakura ebi. The chef indicated that I should eat some of it first, then use the leaf to wrap the remaining rice and shrimp and eat it whole. 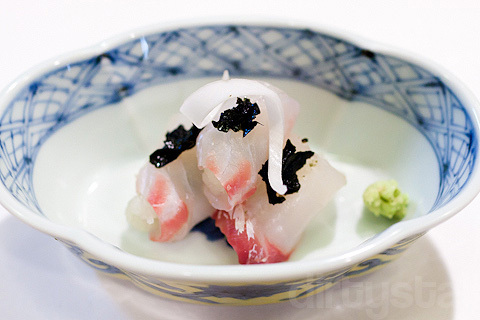 The sakura ebi really had a delicate taste to them, something that I’ve not tasted before. The table was set for the final dish. And the chef was finishing it up as well. 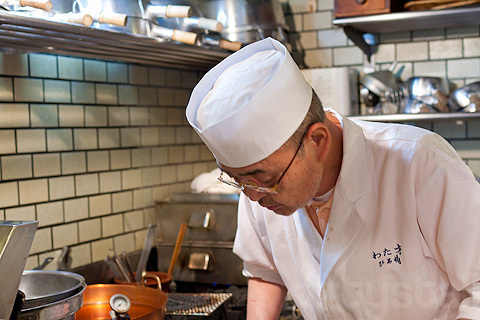 And this is something that Hirosaku is also famous for, their own hand-made zaru soba noodles. Thinner than the usual soba noodles and they have a very nice springy bite to them. They have this clean feeling to them which makes you just want to keep eating them! 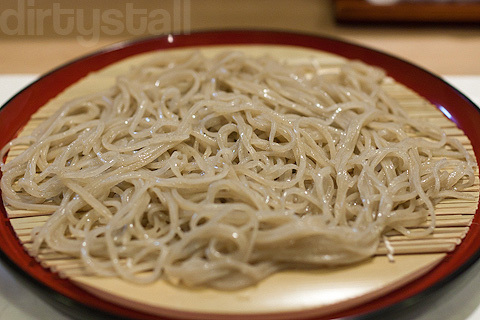 And once I’m done with the soba, I mixed the remaining soba-tsuyu with the soba-yu, which is left-over starch water from rinsing the noodles. 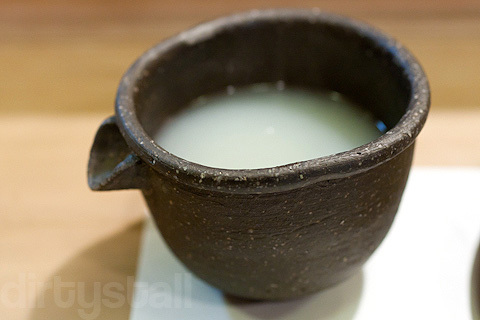 Kinda like the ‘soup’ that accompanies the soba noodles. 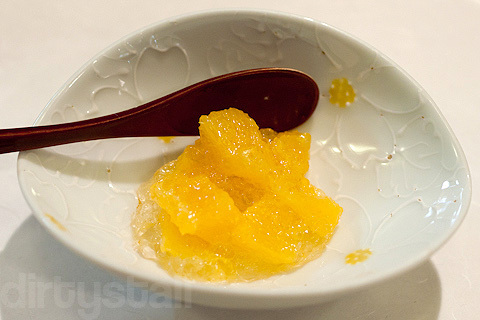 Dessert was some extremely fresh and juicy chunks of orange and some pieces of unidentified jelly. Very simple but I could really taste the sweetness of the orange. Looks reallllyyy good! How much was the meal? Very affordable! Only 2500 yen, which is about S$40 or so. heh no haha. 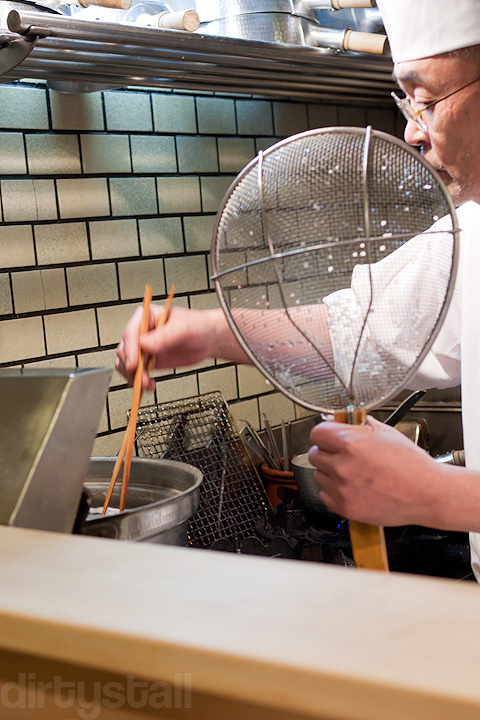 You can get anago tempura at Tenshin, my favorite tempura joint in sg. SGD$40 sounds very affordable for such a good lunch! Ohh that I didn’t know! Yah their lunch is very good value for money because of the quality but their dinner is super expensive! It starts at S$400 and up hahaha! 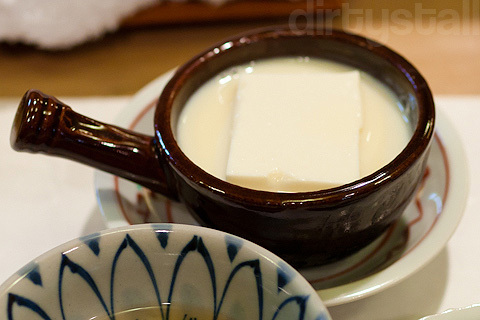 …just a simple bowl of tofu. But what a bowl of tofu it was! I want that bowl of simple tofu! LIKE! Thanks! 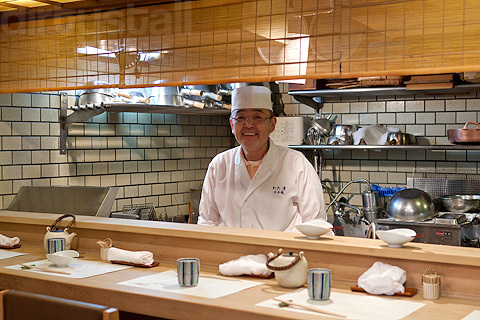 Hirosaku is actually a Michelin 1 star restaurant, so I read about them in the Tokyo Michelin guide. 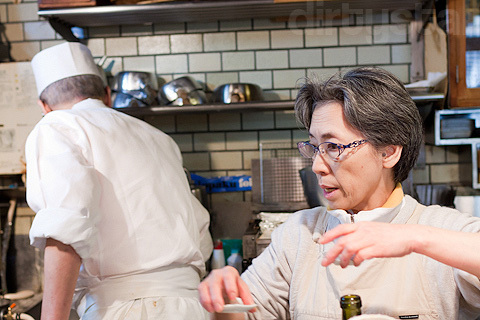 But their lunch price is a decent 2500 yen while their dinner is an astronomical 25000 yen! 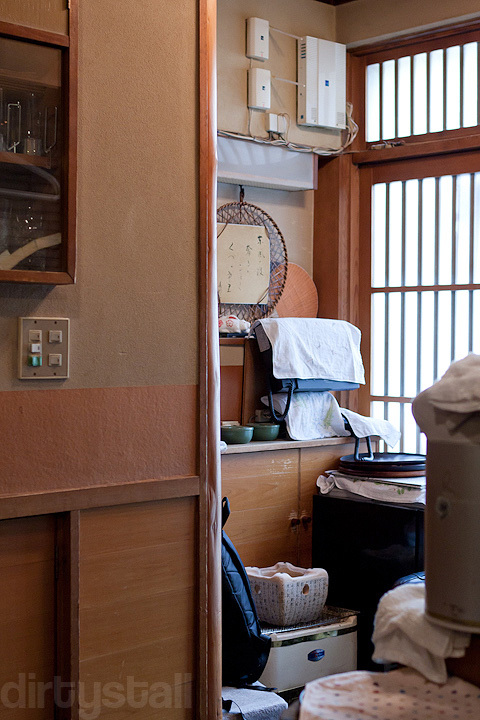 You are lucky, Alkanphel: great meals at $40, that can only happen in Tokyo. I’ll try touching base with you (for advices) as soon as I would have gathered enough money to make a culinary travel there. I am going to Japan in June…. how do i get a reservation?? Hi Margi, you’ll have to call them up to make a reservation.